Sensitive from 400nm to 1100nm, with a 65° viewing angle. 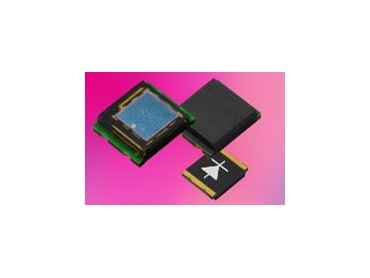 VISHAY Intertechnology, represented in Australia by Braemac , has released four PIN photodiodes in a miniature surface-mount package measuring 4.24mm x 5mm x 1.12mm. Thee additions to the TEMD5xxx line of PIN photodiodes combine high-speed response and excellent sensitivity, enabled by optional daylight filtering and a choice of 7.5 mm2 and 5.7 mm2 radiant-sensitive areas. They are suitable for applications in the industrial, automotive and medical markets and can be used for high-speed data transfer, light barriers, alarm systems, linear light measurement, glucose meters, automotive rain/light/tunnel sensors, smoke detectors and electronic toll systems. The TEMD5010 and TEMD5020 provide visible-light sensitivity ranging from 400nm to 1100nm. With integrated daylight filters and a peak sensitivity of 850 nm, the TEMD5110 and TEMD5120 are more suitable for detecting infrared light. All four of the devices have a 65° angle of half-sensitivity and a 100ns typical response time. These devices are packaged in lead-free constructions in accordance with ELV 2000/53/EC, RoHS 2002/95/EC and WEEE 2002/96/EC. Each of the plastic packages is compatible with lead-free reflow solder assembly as specified by product data sheets.